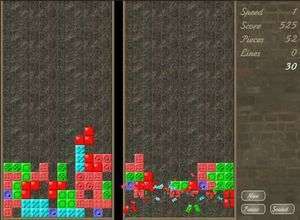 At the first glance the idea of the game is as in Classic Tetris - to fill horizontal lines of the game pits with the falling pieces. More lines you fill, higher score you'll achieve. The falling figures may consist of one, two or three little squares. Looks easy? For security reasons, you should also check out the Tetris Clone download at LO4D.com which includes virus and malware tests. Additional screenshots of this application download may be available, too.